It's a perfect autumn day here in my corner of Colorado, so we're enjoying lunch outside on the deck. I'm keeping it quick and light to match the feeling of the day. 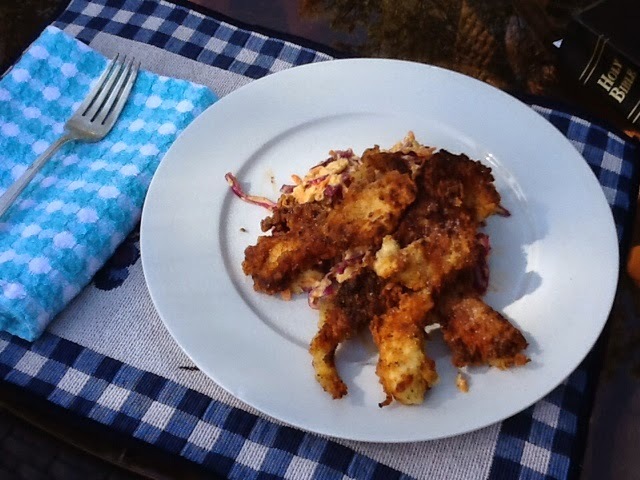 I had chicken fingers soaking overnnight in kefir (tastes just liike buttermilk, and you can use that as well to tenderize the chicken meat and give it great flavor). Then I place about a cup of flour in a gallon-sized zip top plastic bag, added pepper, season salt, and all-purpose herb seasoning, mixed it all togther and then began adding the pieces of chicken fingers a few a time, sealed the bag, and gave it a good shake to coat the chicken. After that, I fried the chicken in a little bit of canola oil to brown, and then placed them in a 350F oven to finish cooking. For the slaw, I finely chopped about two cups of red cabbage so that it looked like thin shreds of red confetti. I used a box colander to shred a handful of carrots. Then, since I had a bit of fennel bulb, I shredded that and added it in as well. Combining the cabbage, carrot, and fennel in a bowl, I mixed in a quarter cup of mayonaise and a teaspoon of vinegar...you can use your favorite...a teaspoon of celery seed and a good grinding of pepper. And that's it! 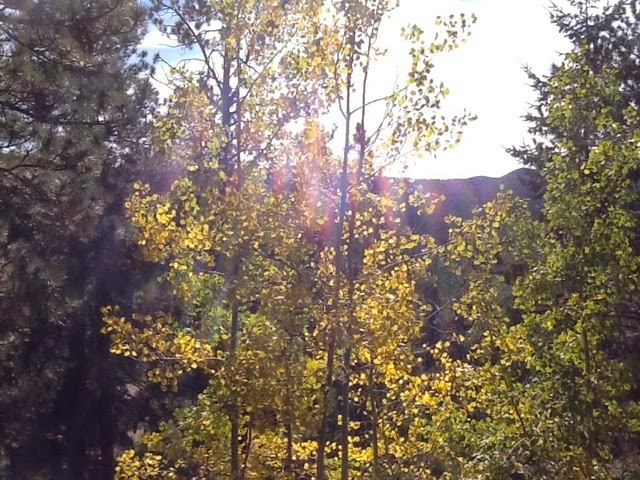 The entire lunch is ready in less than thirty minutes, which give us time to get outside and enjoy the beautiful golden aspen in our backyard.